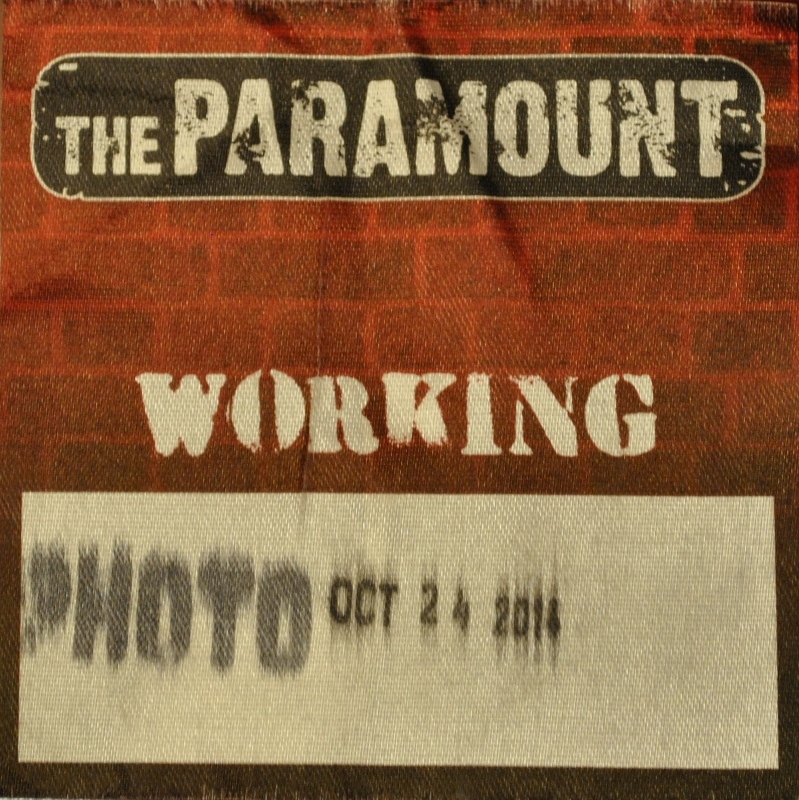 This Backstage Pass column will be a labor of love for me. 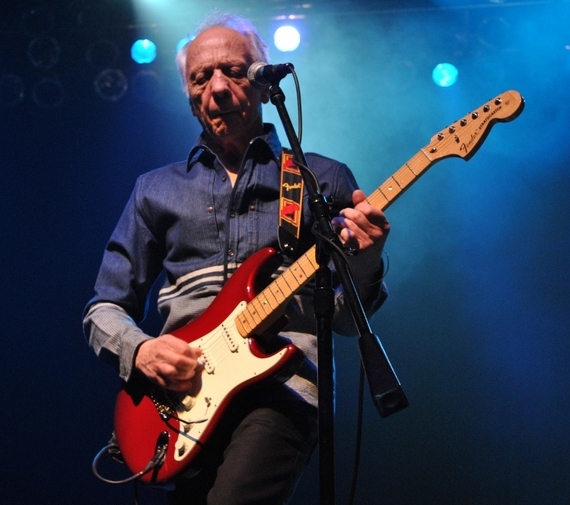 You see, when I was fifteen I wore out a copy of Robin Trower's album, "Bridge of Sighs." I had a surfer friend of mine draw a windswept wave on the album sleeve, then recreate that on the wall of my bedroom. 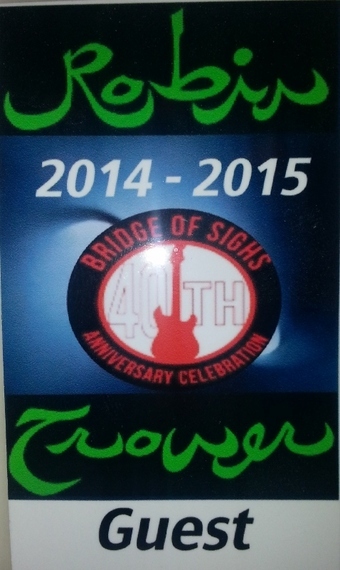 So when the 40th Anniversary tour for Bridge of Signs came along, I was all-in. With then lead singer and bassist, James Dewar, Trower and "Bridge of Signs" attracted the attention of harder rock, long-hairs like myself quickly. 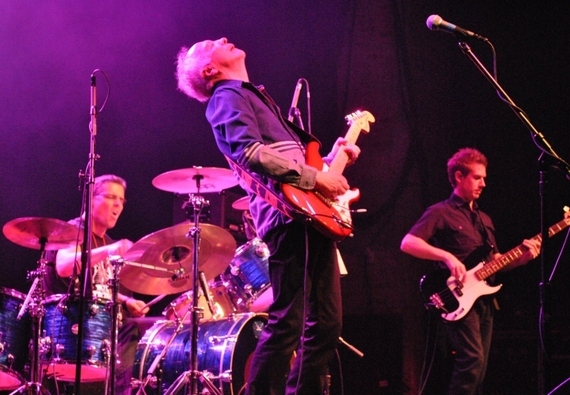 The three-instrument, Power Trio nature of the original Robin Trower band was reminiscent of Cream and Hendrix. That's what got me. 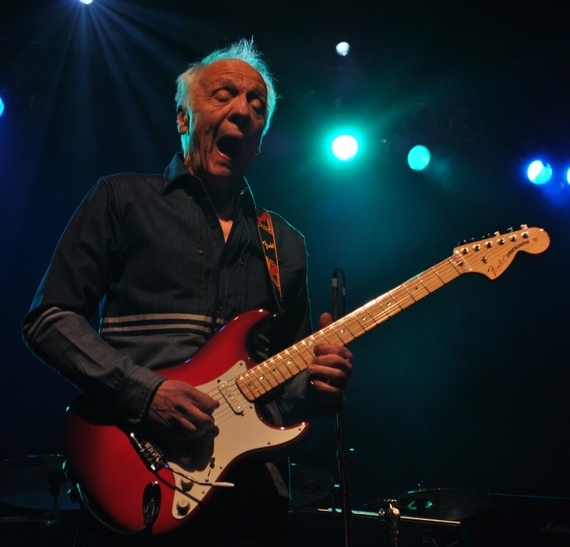 Robin Trower's journey has been a saga. From Procol Harum to his solo career spanning 50 plus years, Trower has remained consistent and significant. 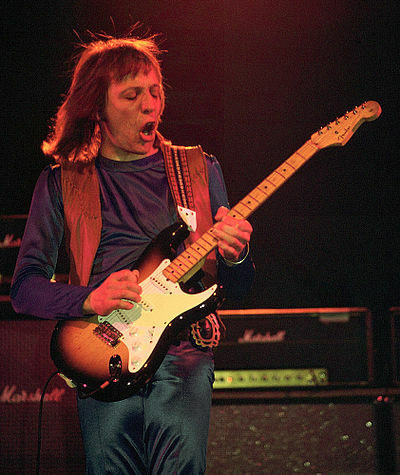 Playing his trusty Fender Stratocaster, Trower has rocked several generations and rocked them well. Now, approaching 70 and graying gracefully like most of us try, Robin Trower is a force to be reckoned with as he performs with all the subtlety of a 747 landing. 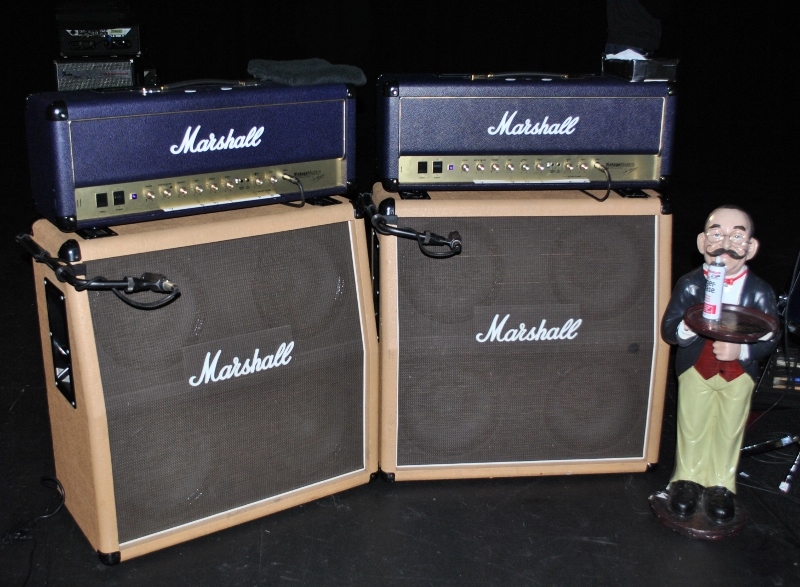 His Marshall amps are still pinned; his speakers blare inimitably; and his notes soar farther and longer than a glider on an updraft. 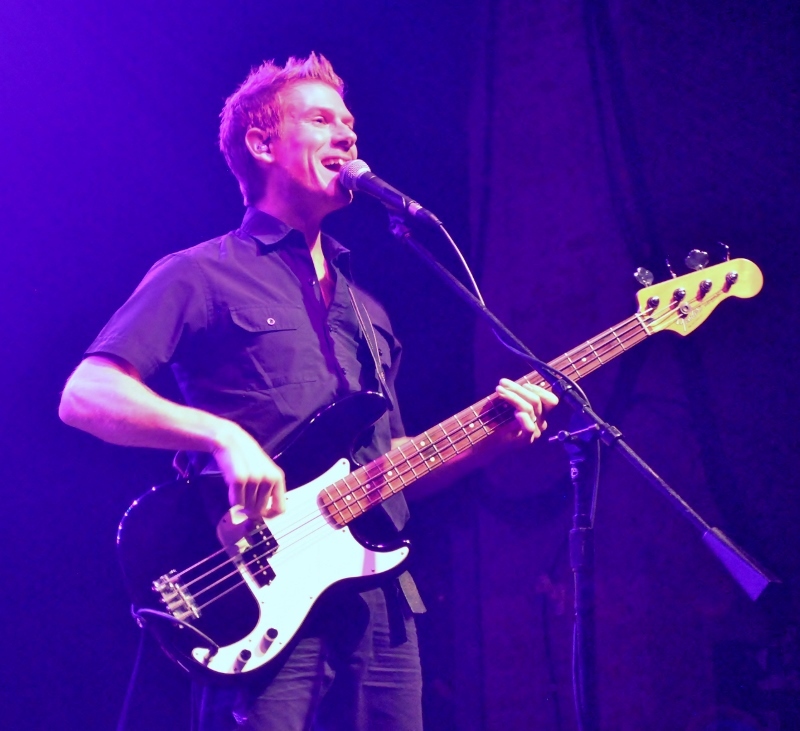 Watts is English and one helluva bassist, multi-talented musician and vocalist. James Dewar's singing shoes are very hard to fill indeed, but Watts is up to the challenge. 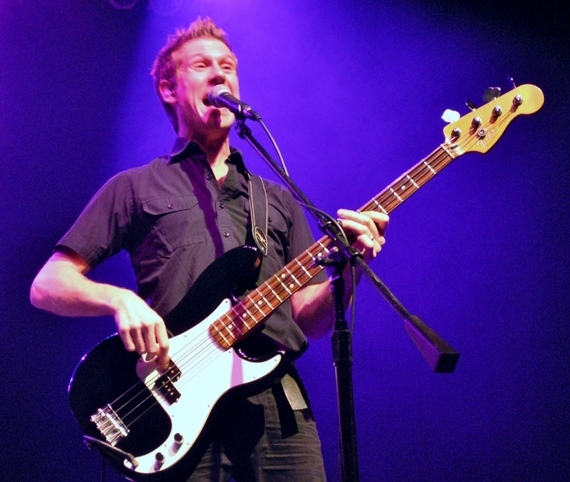 Watts had never played the bass guitar until Trower asked him if he could learn it for his upcoming tour in 1999. Taggart hits the skins about as hard as any other and provided the strong back-beat all night long. 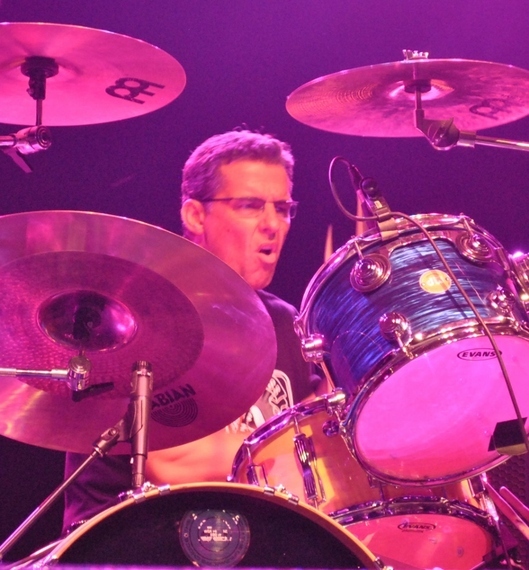 Also English-born, Taggart is a longtime studio, session and tour drummer who has played for far too many productions and concerts to list here. 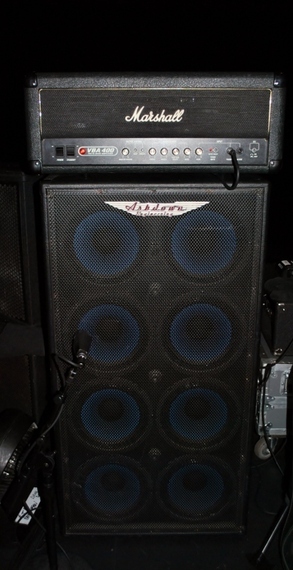 Toni Haimi is Robin Trower's guitar tech and was the back-line tech for Jack Bruce previously. 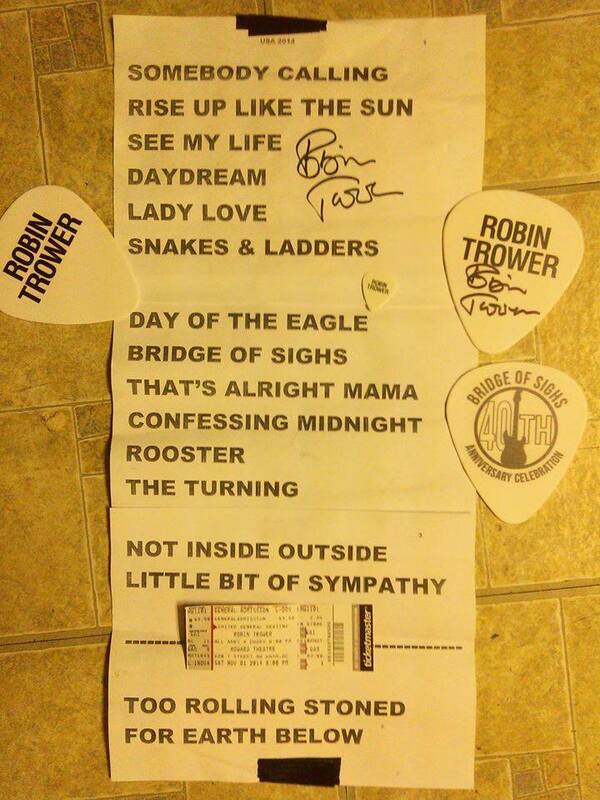 "When Robin travels on tour, he loves those signature Strats Fender made for him; they're all he needs really. The three signature Strats I take care of for him were very well set-up for him by Fender. 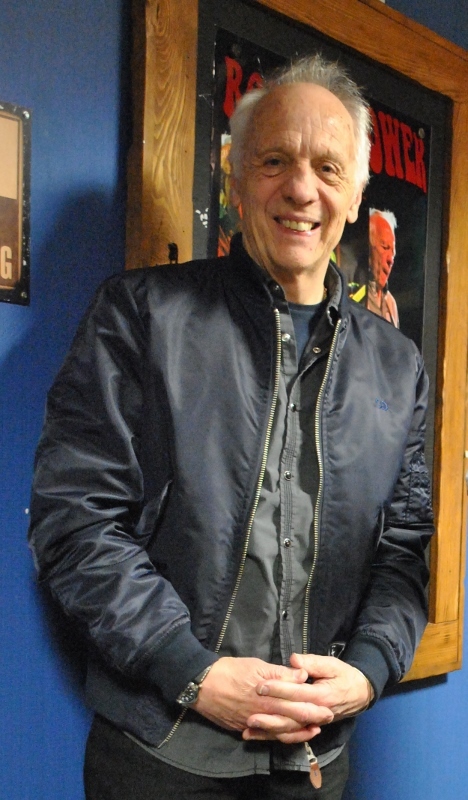 Robin's got a man at the Fender Custom Shop who gets them in shape for him." Do the whammy bars throw them out of tune all the time? "Bear in mind it's got a floating tremolo with three springs in the back, so they stay in tune pretty well. He's got the usual Strat pick-ups, 50's on the neck and 60's in the middle and then a special pick-up too. When we finish the show, normally the tour manager and I go to the next town right away, so we arrive about 4am and check into the hotel. Then I immediately start re-stringing the guitars. He usually uses one guitar throughout the whole set, so we have one as a back-up. He hasn't broken a string yet because I spend a lot of time stretching the strings at 4am, then re-stretching them before sound-check. 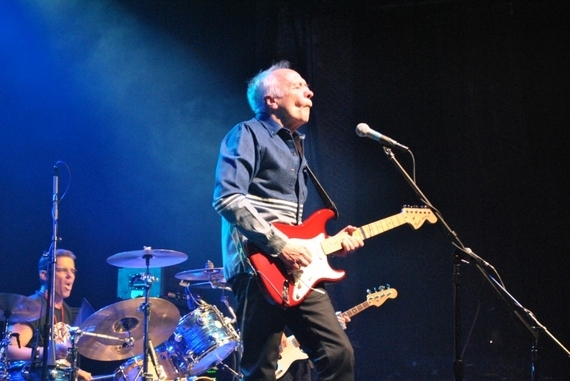 Robin uses heavier gauge, Ernie Ball strings, 12's, 15's, 17's, 26's, 36's and 48's and tunes his guitars to a D."
The "Robin Trower Signature Fender Stratocaster" made for Trower by the Fender Custom Shop. 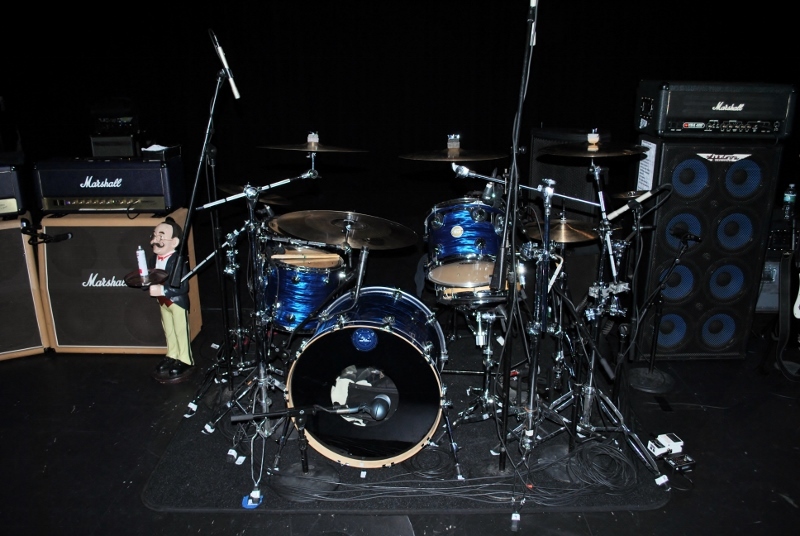 Trower's two current tour models below. Located in Huntington, Long Island in Suffolk County, New York, The Paramount is a superbly rehabilitated theater that hosts a number of diverse, top-tier performances by rock, pop, comedic and even pugilistic performers. 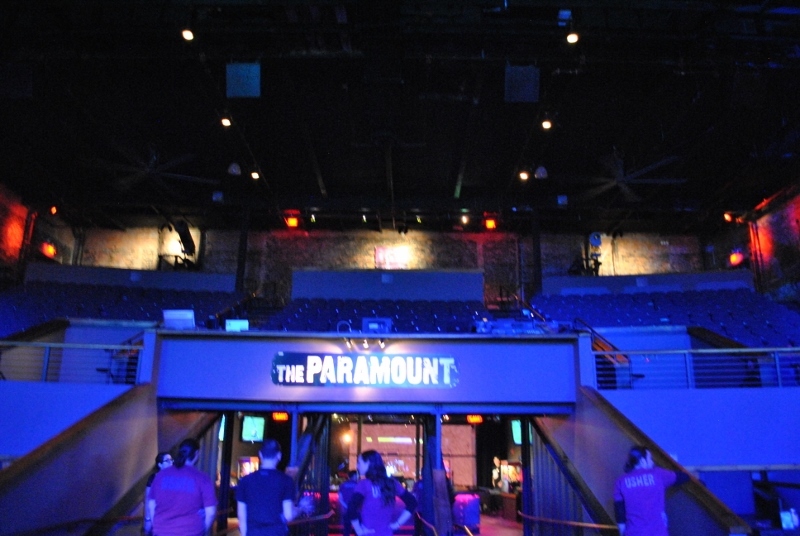 Kicking off with a series of concerts by Billy Joel, The Paramount has quickly turned into one of Long Island's top concert venues. 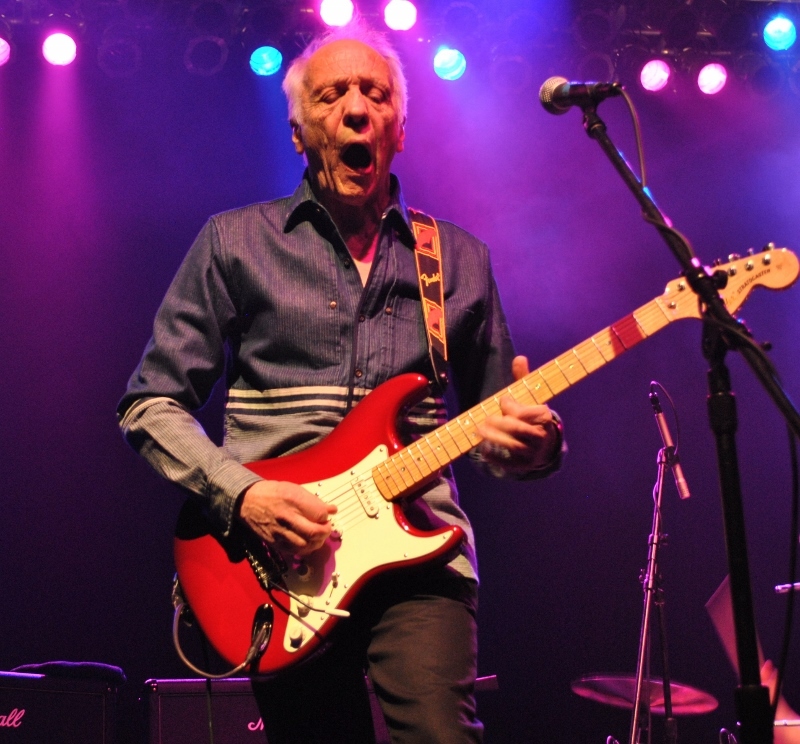 Robin Trower's sound-check is like a mini-concert complete with wailing and full song checks. 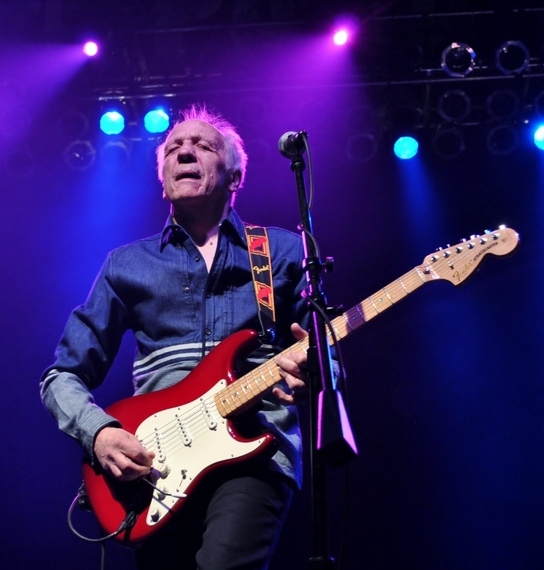 During this one, Trower spent considerable time checking and adjusting a new guitar effect. "What's exciting to you?" 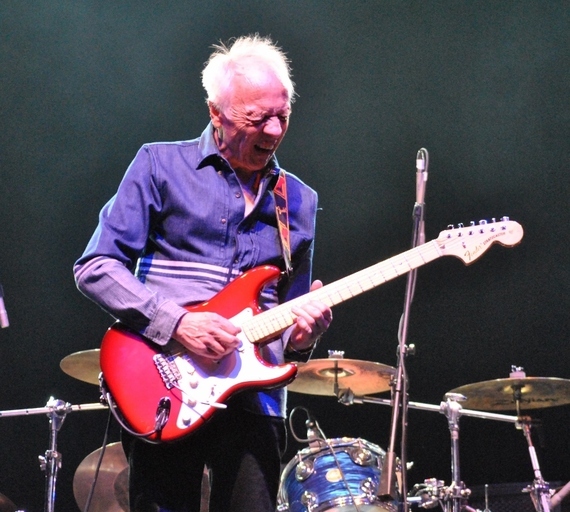 I asked Robin Trower in his dressing room. "Well, obviously it's great to be back in the States. It's been a while since I've been here. 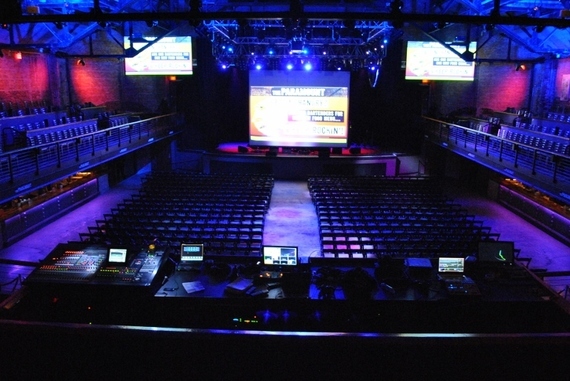 Touring in the States is a very special event, really because the fans know so much of what I've done. Nowhere else in the world do they know as many of the bits and pieces I've done as here in America." 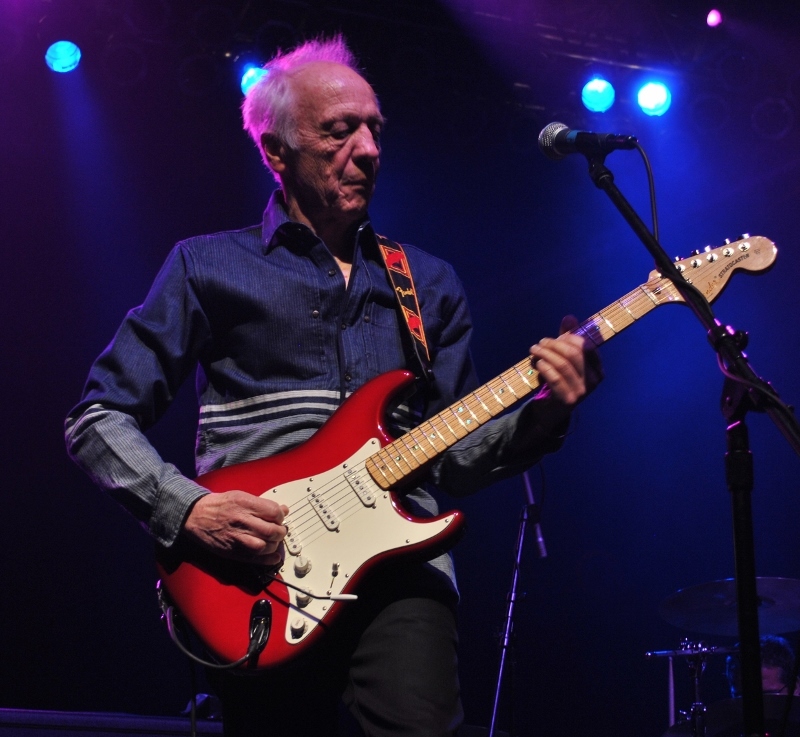 With regard to his new release, "Roots and Branches," Trower told me, "I decided that I was going to do a covers album originally, and I had about a dozen old songs I'd like to try. But in the end, I only came up with about six, what I would call fresh arrangements of these songs. So I mixed in some of my own writings, and hence the name 'Roots and Branches.' 'Hound Dog' was one of the first things I had. I don't know how I alighted on it. The Big Mama Thornton' version was the one I had in my head. I purposely didn't listen to any of the tracks at all, until I had the arrangement I was going to do. Because I didn't want to be influenced too much by Elvis's version or Big Mama Thornton's version or BB King's version of the 'Thrill Is Gone.' I wanted to have my own take on them. 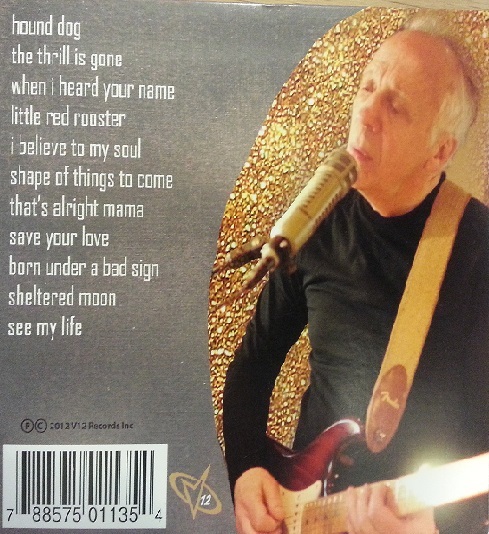 I do the singing on 'Hound Dog,' 'The Thrill Is Gone' and 'Little Red Rooster.'" When did you first pick up a guitar and know you wanted to be a guitar player? "I think I wanted to be a guitar player because of Elvis, really. Scotty Moore was a huge influence on me. My Dad bought me a guitar for Christmas when I was about 14, I think. I seemed to have an understanding of how it worked," Trower chuckled softly. "I think the next big influence would be BB King. I was already playing my own ideas; not really copying anybody else. But when I heard BB's playing, that really changed my whole thinking about lead work ... you know, the bending of the notes and the vibrato. That was a real paradigm shift, as they call it." "And then Hendrix was a big influence on me. I didn't get to see him until about three weeks before he died. 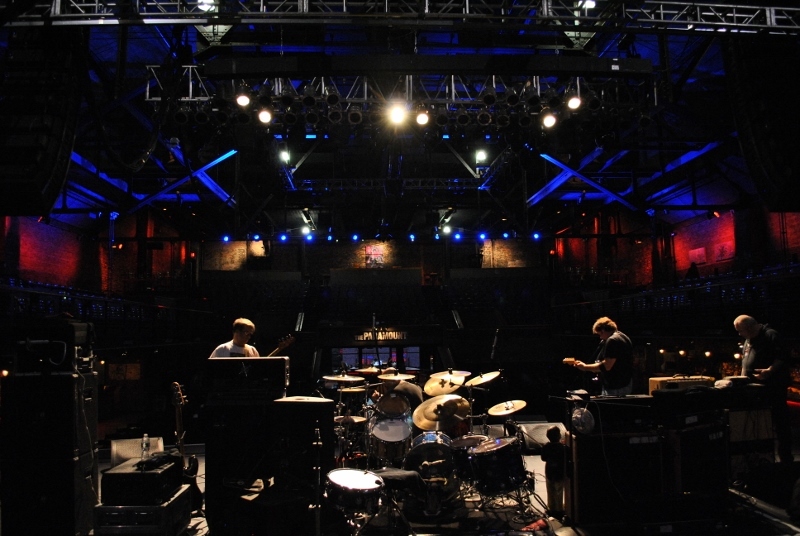 I was with Procol Harum and we opened up for him in Berlin. We opened and Ten Years After and a few others were on that bill." Who of the American guitar-slingers do you like? "I like ZZ Top. I love the way Billy Gibbons plays. After Hendrix, I think he's my favorite rock 'n roll guitar player." "I really want to do my own stuff; what I want to do. You know working with other people is complicated. I did work with Jack Bruce and we did a lovely album together. That was different because we co-wrote all the tracks together." How did you first start playing your trademark Stratocaster? "Martin Barre of Jethro Tull played Gibsons but had a Stratocaster onstage when I was sound-checking. And I picked it up, plugged it into my rig ... and that was it. I was playing a Gibson Les Paul Sunburst. Very heavy and a bit sort of one-trick pony in terms of the sound you can get out of the Les Paul. 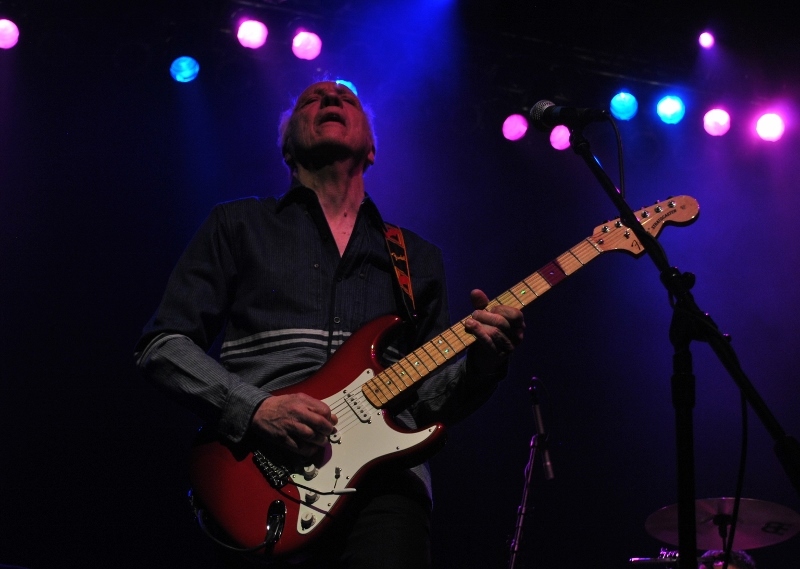 And the Strat is a more expressive sound; it's got a vocal quality to it--a human voice quality to it, which I love." I understand you're playing with some new guitar effects tonight? "Yes, well I can't play without effects (laughs heartily), you know. Mostly it's overdrive. The distortion-overdrive thing is the main part of my sound. I also have a thing called a Deja Vibe that is kind of like a Leslie." Do you have a large guitar collection? "No I don't. I had quite a large collection of vintage Strats in the 1970's but they were all stolen. But in the last few years, these Strats are what they call my signature model. I have a about seven of them now and that's all I play." Will you be playing most of the stuff from "Bridge of Sighs" tonight? "Yeah, they're the most requested songs, I love playing 'Day of the Eagle,' 'Bridge of Sighs' and 'Little Bit of Sympathy' ... I love those songs. Anything that gives me a chance to solo. They're some of the best songs I've written." Is there anything you'd like your fans to know? "Yes, well I've just finished a new album which is coming out in January which is all originals. Very Blues/Rock. I'm very proud of it." 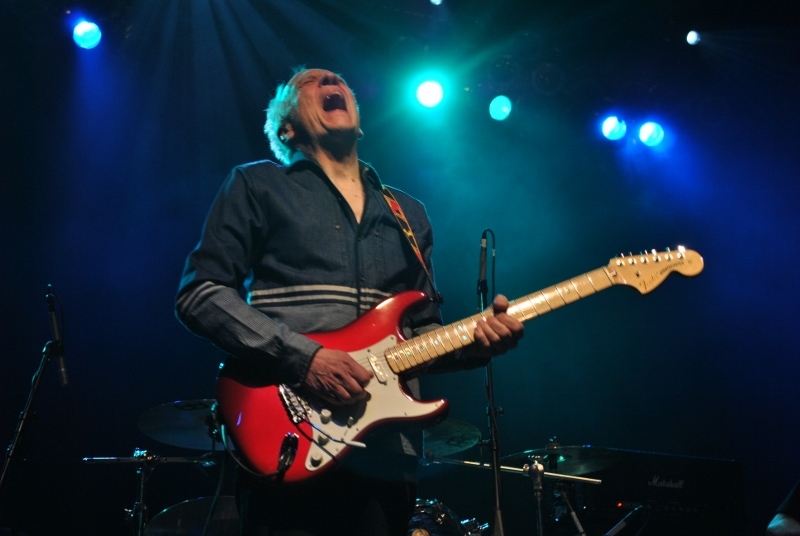 The audience was an experienced, seasoned crowd of Robin Trower aficionados and proceeded to show the utmost respect for their guitar god. Well past the age of rowdiness or extreme behavior, most in attendance thoroughly enjoyed the concert without having to resort to any hostilities or fisticuffs. A good crowd by any standard that was entirely satisfied with the Trower proceedings. As the crowd had finally settled into their seats and began getting restless, the stage was set. 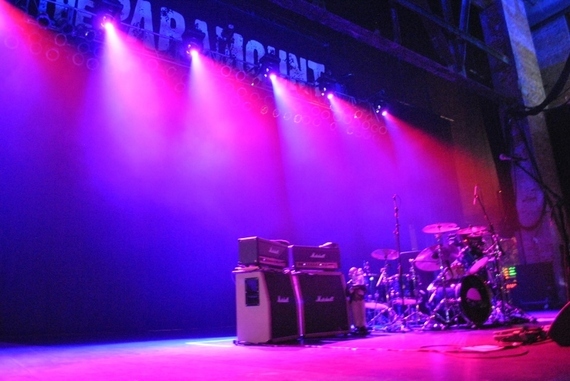 The lights would soon come down and our regal maestro of the Stratocaster would join us. 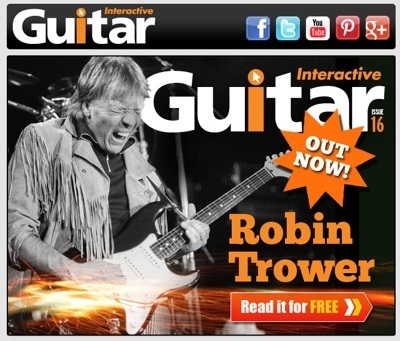 Robin Trower didn't waste any time with flowery intros or finger calisthenics, no he didn't. Trower went right for the jugular of the high notes mercilessly. With bassist and vocalist Richard Watts covering the vocal duties admirably, Trower is free to roam shrieking on his Stratocaster. Honestly, Watts sounded as good as James Dewar, the original Trower voice. 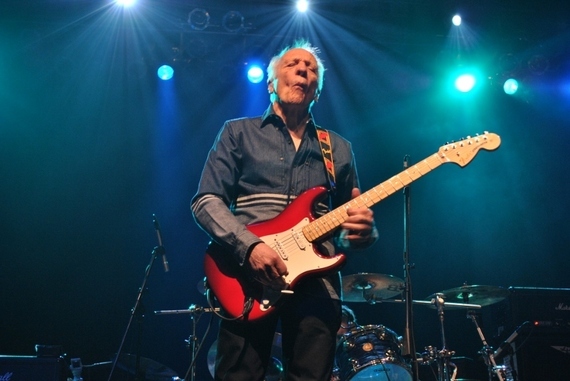 Now, one of the things that should mentioned early on about Robin Trower is that he's so into his music, so concentrating on his guitar playing, that it's almost as if he's in a trance-like state. It is during this condition that he makes some of his greatest faces. For those who have seen Trower perform live, as I have, they might readily agree with me that these signals of focus on Trower's part make the show better somehow. 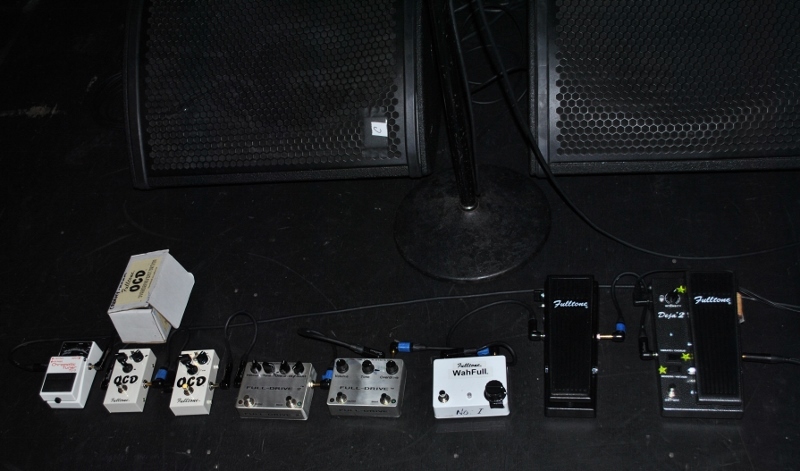 When Robin Trower makes a move to his effects foot-pedals, as he's doing below, strange and wonderful sounds ensue. "Day of the Eagle" and "Bridge of Sighs" completely took over the venue as Trower recreated some of the best hard rock from the 70's. A solid, albeit heavy metal style, Elvis impression of "That's Alright Mama" and then the dark and mysterious instrumental, "Confessin' Midnight" were surreal. A sultry "Little Red Rooster," sung by Trower himself was dreamy and like Clapton played it with the Stones, had plenty of lead guitar solo breaks. A personal and crowd favorite, "Little Bit of Sympathy" nearly brought the house down, as Trower expanded his soloing greatly. Here's an 'old school' version from 1974. 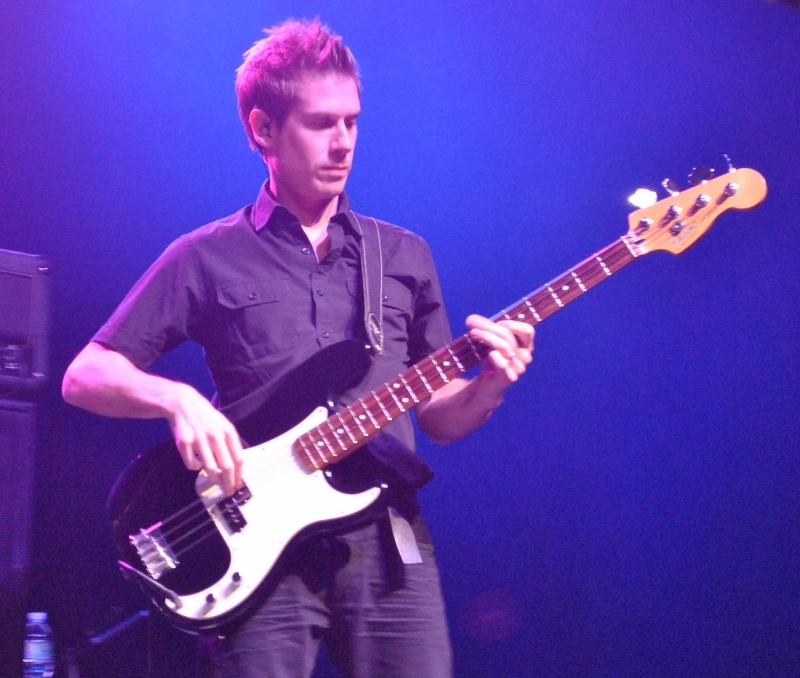 Richard Watt's strong, steady bass lines set the pace throughout the evening. A couple of Trower favorites, "Too Rolling Stoned" and "For Earth Below" finished a strong set from Trower. It left the audience in a shambles.